Sulfate-free moisturizing shampoo for curly & wavy hair with a low-lathering, sulfate-free formula that gently cleanses and adds extra moisture when left in longer. 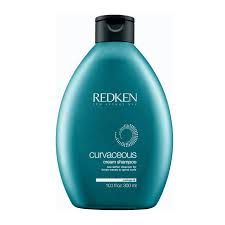 Try this curly hair shampoo to maintain hair's natural oils and to enhance definition. Delivers 97% reduction in frizz with the use of Curvaceous Shampoo, Conditioner, and Full Swirl vs. a non conditioning shampoo.